I guess nothing has really changed down in Durban? 2018 can, perhaps, be called a successful year, if qualifying for a playoff slot is your only criteria. Sadly, despite their qualifying for a quarterfinal, the Sharks did nothing to suggest that they had improved on a somewhat dismal 2017. Yes, they did score more tries in 2018, a whole 11 more than they managed in 2017 – scoring 49 versus the 38 of the previous year. Scoring more tries is a good thing. But, and it is a big BUT, they conceded a whole 57 tries, twenty more than the 37 of the previous year! Their win/loss stats also deteriorated year on year. In 2017 they managed to win 9 of their 15 starts, while 2018 saw just 7 wins in 16 starts. Qualifying for a quarterfinal berth after just 7 wins, with a meagre 36 log points and a negative points difference of -5 is not really a record to be proud of! So, perhaps 2019 will be their year? The problem is that they have been saying that every year is “their year” – 2008 through to 2018. It is all so very frustrating, because the Sharks have always had the firepower, the talent, the ability, the experience and the squad, yet they always seem to slip just when we expect them to charging ahead of the rest of the South African pack. During 2017 Coach Robert du Preez played to a game plan that favoured the old style of mid-field pressure through consecutive pods of forwards, using a powerful pack to dominate opponents. This was a traditionally South African approach, and it had worked well against weaker opponents, sometimes it worked against one or another of the big guns too, but often ran into the wall when cleverer, more mobile opponents showed up and simply took the game away from contact with the Sharks forwards, and ran them ragged. 2018 was no different. There were some signs of more enterprising play, especially when touring in New Zealand, but this became the exception rather than the norm. Time and again, the Sharks lapsed back into old habits and tried to play old-style battering ram rugby. Will we see a more ambitious game plan, modern thinking and tactics? I will not be holding my breath! The Sharks have not announced a whole lot about their squad for the 2019 season. We know of a host of departures, but very little about new signings. 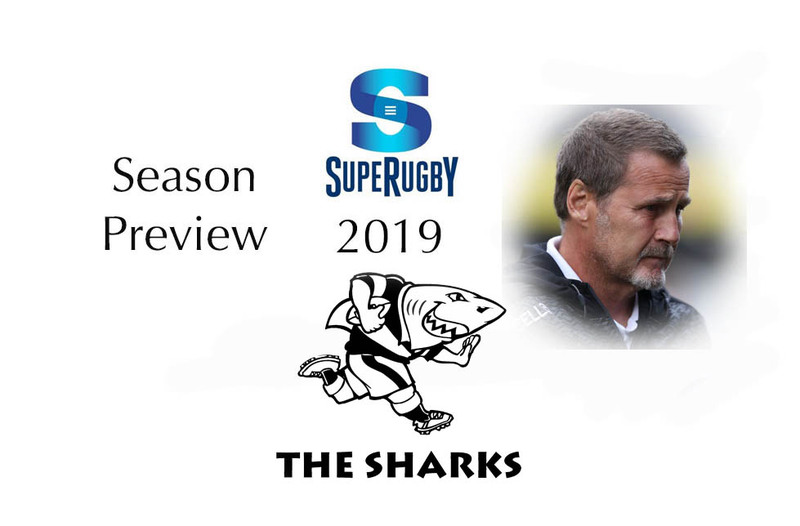 We know that the Sharks go into 2019 without Ross Geldenhuys, Franco Marais, Stephan Lewies, Keegan Daniel, Michael Classens, Garth April, Tristan Blewett and Johan Deysel. The only confirmed signing is that of Ruben van Heerden from the Bulls. I would guess that there will be a lot of the Currie Cup squad and development players joining the Super Rugby squad and getting game time, the likes of Gideon Koeglenberg, Jeremy Ward and Aphelele Fassi? The Sharks come into 2019 on the back of a successful Currie Cup season. Although this is not an automatic guide to Super Rugby success, it does suggest that the Sharks have some depth in their development squad and that they might be able to make the step up into Super Rugby. Much of their success will revolve around the form and fitness of their No.10, Robert du Preez. When he is on song he brings a calmness and focus to the game, with a willingness to take the ball flat and into contact in an effort to cross the gainline before releasing his outside backs. Unfortunately he has a tendency to blow hot and cold, especially when his confidence has taken a knock. After his horrid debut in the Springbok green and gold in June 2018, his form seemed to slip and he struggled to impose himself as he had earlier in the season. His outstanding goal-kicking remains an asset no matter what his playing form. Whether the Sharks will be able to live up to expectations and deliver on their obvious potential remains to be seen. They have the players, but do they have the coach and game plan? The Sharks has been runners-up five times, losing semi-finalists four times and reached the quarterfinals on another three occasions. Can we expect more in 2019, or will it be more of the same? More of the same – possibly another quarterfinal, but a another mid-table finish.